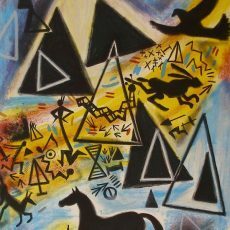 Jaune Quick-To-See Smith (born 1940) is a Native American contemporary artist. Notably her work is held in the collections of the National Museum of Women in the Arts the Smithsonian American Art Museum, the Whitney Museum of American Art, and Museum of Modern Art in New York City. Smith has been creating complicated abstract paintings and lithographs since the 1970s. She employs a wide variety of media, working in painting, printmaking and richly textured mixed media pieces. Such images and collage elements as commercial slogans, sign-like petroglyphs, rough drawing, and the inclusion and layering of text are unusually intersected into a complex vision created out of the artist’s personal experience. Her works contain strong, insistent socio-political commentary that speaks to past and present cultural appropriation and abuse, while identifying the continued significance of the Native American peoples. A guest lecturer at over 185 universities, museums and conferences around the world, Smith has also shown her work in over 90 solo exhibitions. Her work has been reviewed by The New York Times, ArtNews, Art In America, Art Forum, The New Art Examiner and many other notable publications. She has curated numerous Native American exhibitions and serves as an activist and spokesperson for contemporary Native art. She is in many private and public international collections, including The Whitney Museum of American Art, NY; The Museum of Mankind, Vienna, Austria; The Museum of Modern Art, Quito, Ecuador; and The Museum of Modern Art, NY. Among other honors, she has received the Joan Mitchell Foundation Painters Grant, a Lifetime Achievement Award from the Women’s Caucus for the Arts, the College Art Association’s Committee on Women in the Arts Award, the 2005 New Mexico Governor’s Outstanding New Mexico Woman’s Award, and the 2005 New Mexico Governor’s Award for Excellence in the Arts (Allan Houser Award). Smith also has been admitted to the New Mexico Women’s Hall of Fame.